Heather Hyatt a.k.a. 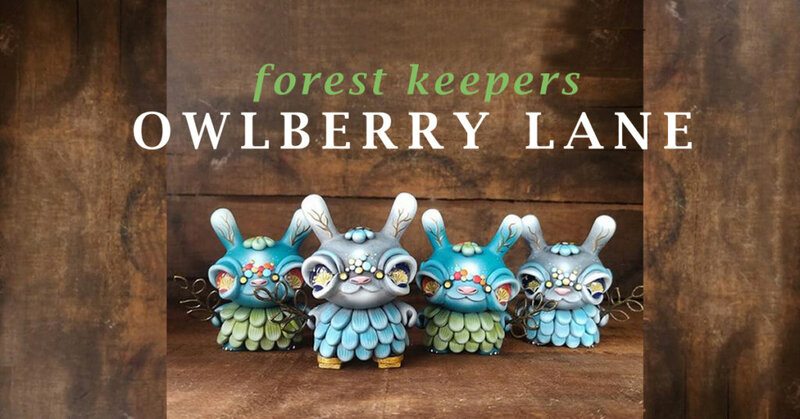 Owlberry Lane did a Dunny throwback and will release four classic Forest Keepers into the world today at 10 am CST / 17 pm BST. Heather has a great eye for detail. These 3 inch Kidrobot custom Dunnies have hand sculpted parts and are hand painted with acrylic paint. They also have glass eyes and come with a brass leaf accessory. The Forest Keeper Dunnies will be available at her shop at $80.00 each. Price will include free USA shipping. The Forest Keepers are a pretty constant force on Owlberry Lane. These spirits sweep among the branches and the shadows, breathing life into the seedlings growing on the forest floor. When they find an itinerant chipmunk trying to eat what is not theirs, they show no mercy. Chipmunks do that, you know. All the time. If you suspect the keepers look a bit impish, it is not your imagination. Follow Heather at Instagram or go to the Owlberry Lane shop!